Two years after his disappearance at the hand of extra-terrestrial forces, Mark reappears, but as a completely different being. 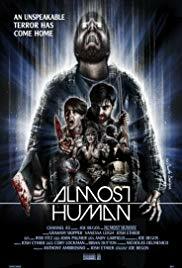 With Almost Human, Joe Begos decided to revisit the alien abduction genre, and does so with two things: brutality…and a bearded lumberjack! I was initially pretty excited by the film’s trailer, which foretold an unusual and hopefully innovative movie. This average slasher/monster film has some good ideas, and adding some slasher elements to the alien genre is definitely one of them, but this is done at the expense of the story, which is not fleshed out enough to be interesting. Indeed, the plot (if we can call it a plot) surprises by its simplicity. A dude gets abducted by alien and comes back to kill everyone, and that’s pretty much it. The thing that shocks most about Almost Human is the brutality of its murders, they are not elobarated but shockingly efficient. Splatter-lover will probably find it the best aspect of the film, whereas others may see this as unjustified violence. One thing is however difficult to argue over: the choice of Josh Ethier (Chillerama, Hatchet III, Contracted) as the main actor is fantastic! The giant bearded dude has the perfect look for the job, and gives much of its soul to the film. I found the rest of the cast, however, to be quite irritating. 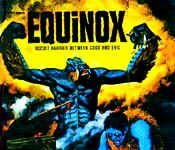 Towards the end, the film takes an unexpected turn and really bizarre things start happening, transforming this rather lame splatter into a fucked-up alien monster film. As strange as that sounds, this is actually the best moment of the film. Only at the very end does the very cliché aspect of the characters’ behavior come to spoil the fun. I couldn’t identify whether this was unintentional, or made on purpose so as to finish the film on a comedy tone. In any case, the all cinema was laughing out loud at the end, in a mixture of entertainment and mocking that summarizes pretty well the film’s genuine quality.